Do you remember an advert by a certain credit card? They referred to the card as a flexible friend. A misnomer if ever there was! My flexible friends in the kitchen are lentils. Cheap, tasty and nutritious. They are packed with protein and in my mind an often forgotten meal. People tend to think of them as tiresome as they need soaking, tasteless, dull and yes even gas producers 🙂 Let’s right a few of those wrongs. 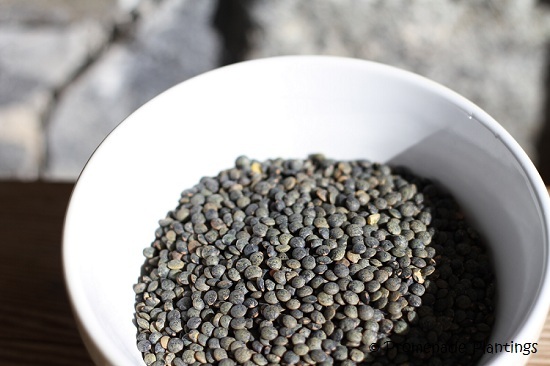 There are a myriad of lentils out there but for todays meal I’m going to cook with Lentilles Du Puy, or if you can’t get those (and they are a bit more expensive) Green lentils. Besides as I’m back in France it would be rude not to start with my hosts own lentils.These lentils need no soaking, are quick to cook and very adaptable. 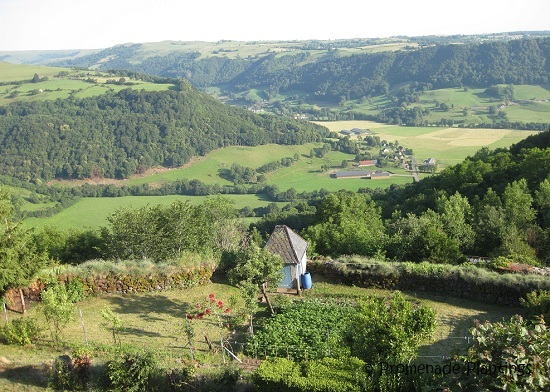 Auvergne Vegetable Garden 2011 – what a view! I said they are adaptable, they are both a winter and summer food for us. For winter warmers we use them as alternatives to meat in Lasagna, Moussaka, Shepherds Pie or should that be Cottage Pie, maybe I should settle on Gardeners’ Pie to name a few, and yes I need to get round to writing these recipe up. For summer or lighter meals they are easily transformed into salads, with a vinaigrette or fresh herbs, side dishes paired with some baked or grilled fish like Salmon, or as a main course topped with roasted vegetables and some crumbled feta cheese. You see they are tasty too. Elizabeth David in her classic 1960’s book French Provincial Cooking, cooks up a parsley butter version. But I don’t have my book with me (why did I take it home and then leave it there? ), and I’m longing for that dish but can’t remember exactly how to make it. 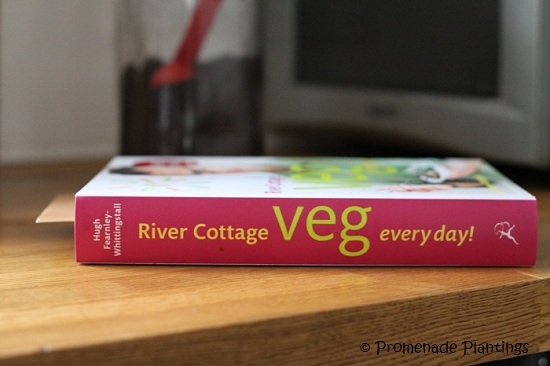 So off to the internet I trawl, and then back round I come to a cookbook that I do have with me Hugh Fearnely-Whittingstall’s River Cottage Veg . He’s obviously a fan, and gives readers a choice of recipes for “Dressed Lentils”. And so I took inspiration, and the quantities from his recipe and made you a my own version. Wash and rinse the lentils, place them in a large pan and cover them with water. Bring them to the boil and cook for a minute or two. Then drain the lentils and put them back into the pan with some fresh water, enough to cover them by about an inch. Why are we doing this? Apparently it stops the “joys” of excessive gas. Now add the garlic cloves, parsley stalks and a bit of vegetable stock if using (alternatively add a bay leaf, half a carrot, half an onion and half a stalk of celery). bring to the boil and then gently simmer for approx 20 to 30 minutes. The lentils are cooked when they are soft to the touch and can be squidged between your fingers. Finely chop the garlic cloves up, along with a shallot and gently saute them in some olive oil and butter until they are translucent and cooked. Add 2 tablespoons of chopped parsley and stir in the lentils. Grind some black pepper and sprinkle a bit of sea salt onto the mixture and cook on a gentle heat for a few more minutes. Turn the heat off and cover the pan, and leave it for 5 minutes so the flavours are absorbed. Or as HFW does make a vinaigrette of olive oil, cider vinegar, mustard, salt and pepper. You can eat them hot, warm or cold. I told you they were adaptable. I made enough so that I could have some leftovers for lunch the next day and ate them with a Toulouse sausage, sliced up, all mixed in with a leafy green salad. I’ve fancied growing some lentils for years. I have finally got myself some to grow, I just need a bit of extra land to try them out. Well if they grow in the Auvergne at altitude they should grow OK in the South East. I bought them from Seeds Of Italy. I realise I probably need the equivalent of a field to grow enough for a few meals, but as a gardener I want to grow them because I can! I also realise they aren’t Puy, as I’m not in the Auvergne, but these ones are Italian. Either way I’m sure they will be tasty and fun to grow. I do wonder if they are an acquired taste? And if so what the answer is? Thanks for the link, an interesting read. I might have to see if I could repeat the test on myself 🙂 It must be horrid not being able to eat certain foods because they don’t taste good, I’m not sure how I would survive without fresh corriander! Hahahaa! I know what you mean. But I actually have several friends that simply can’t tolerate the taste of cilantro/corriander! Adore lentils and have thought of growing them too, but as you say – so much space is needed so we´ll just keep on buying the local ones! I guess I’m just curious to see how they grow and what they look like, I’ll see if I can’t sneak some in somewhere this year. And now I want to know what the “local” ones are like, and recipes?! These recipes sound delicious! I was in an import store last Saturday and saw green lentils but didn’t buy them because I’ve got 2 quarts of lentil soup in my freezer. Now, however, after seeing your recipes, I wish I’d bought them. Well, this won’t happen again! Thanks for the tips! I’m making lentils tonight. I think the word I’m looking for is serendipity 🙂 Hope they tasted good! We adore lentils too – over here in Australia we can now get locally grown blue lentils which are a good substitute for the more expensive puy lentils. Thanks for the recipe, it sounds like a great way to eat them! I can’t cook them without a bay leaf, though…they just don’t taste right without it! That’s a great description “flinty” thank you! It’s odd what I have started to take for granted, I better not mention cheese……. I can’t believe that this is the third time today that a food blogger has made reference to River Cottage. I love lentils…any way they are prepared. I have a large bag of red lentils which I have never used before. It will be fun experimenting with them. Claire, I haven’t see his books or programs but he certainly seems to be popular on your side of the pond. My red lentils are tiny and split so I’m sure that they will be very delicate. I don’t know how I’m going to prepare them yet. I’ll let you know. I’m interested in seeing what the difference in taste will be. Sounds good Claire, thanks for the suggestions. I like to throw in a handful of chopped spinach and several carrot slices. I use beef stock. I love lentils — is all forms. My favorite is mized with pasta is a brown gravy. Yum! Love lentils, all kinds. I can’t believe you actually grew some. I’ve never gotten past buying them in a bag! After reading your post today, there’s just no more excuses for my boring salads! I love this recipe and I love that you plop lentils into all kinds of dishes! I’ve seen some dried at our local natural food store so I’m going to see if they carry this type! Sadly, the only way I like my lentils is in soup 🙂 thanks for the lesson about puy lentils, I learnt something new. I have lentils far too rarely–this inspires me to want to fix some soon! I’m way behind on my emails, so just read your lentil post today–I think it’s funny that we both happened to write posts two days apart extolling the virtues of lentils. I am with you–these are such a kitchen mainstay and an absolute must-have in the pantry. A quick protein source if there ever was one since you don’t have to soak them. And high-fiber, low-fat, and high nutrient (yes, the dietitian voice coming out here). Thanks for some new ideas. And I’d had your dish round at friends a few weeks ago, it was a perfect combination. And you are so right about lentils being good for us on lots of levels, we should all eat more. Hope you have a great week!